SickSea: DOB Shreveport 2.27.14, a photo by trudeau on Flickr. "We have a show this Thursday nite! Sick/Sea will be set up for your listening pleasure. Starts at 7pm All Ages. $3 to get in. It goes to helping the band on tour," says Rex Gilcrease. Krewe of Highland Parade Route 2014, a photo by trudeau on Flickr. The Krewe of Highland parade may start at noon or 1 pm, Sunday, March 2, says Emma McCarty, allowing for the rain forecast. 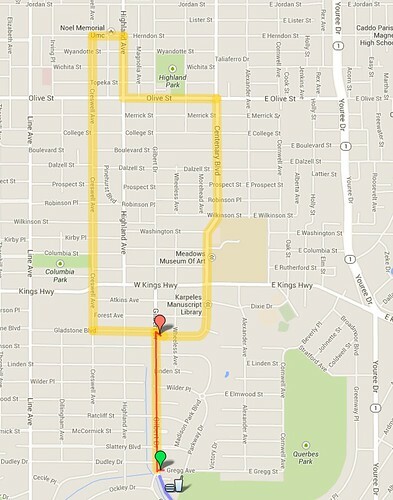 Fern Ave will be closed from 7 am until the parade is finished. 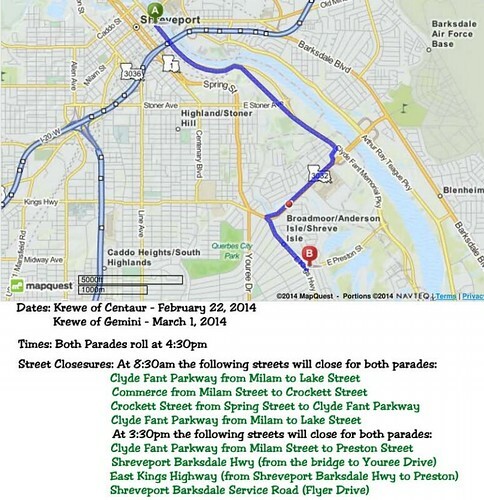 Additional streets on the parade route will be closed at 1:00 pm. The route is the same as last year. 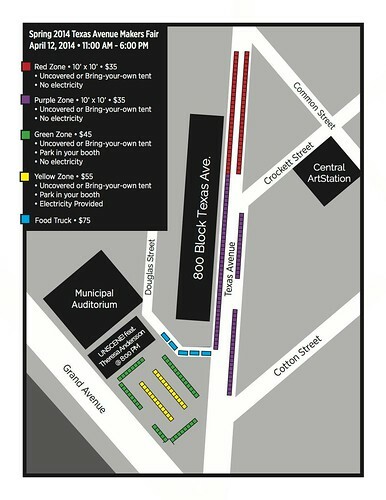 See Sunday updates on the krewe's rain plan at thekreweofhighland.org. Julie Crews, artist, a photo by trudeau on Flickr. Though she says of herself,"I am an oil painter with stakes driven firmly in the painterly realist camp," artist Julie Crews admits, "I am inherently a rule-breaker. I frequently find myself trying to sneak a triangle into the corner of a composition, create uncomfortable tangents and play with multiple focal points." Living in Ruston since 2008, the painter has made Louisiana her oyster. 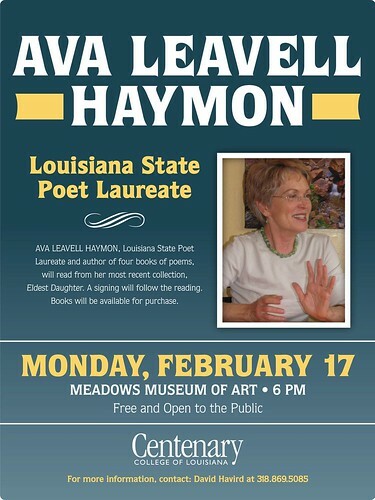 She's been featured by LPB, included in the Meadows Triennial and been given a solo exhibit in Ruston. Crews has also exhibited in Salt Lake City, Savannah and Sacramento. Her subject matter? "I desire to give the viewer an intimate glimpse into my personal life. 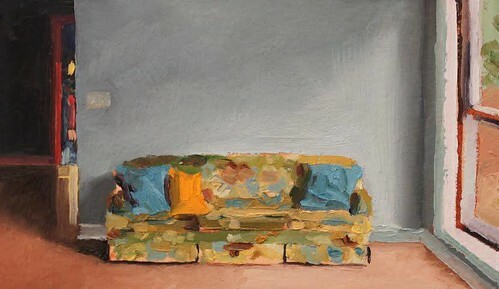 My work concentrates on the very scenes of domestic life that take me away from painting. Some scenes of domesticity require self-portrayal; others are simply familiar scenes of my daily dealings." Painter Talbot Hopkins Trudeau bought one of Crews' oils upon first view. "The luminosity, clarity and beauty of her compositions is very persuasive," she says. Painters John Wagoner and Steve Zihlavsky, also worthy artists, share the gallery show with Crews. Reception Tues, Feb 25, 5:30 to 7:30 pm. The show will remain until April 30. Gallery Fine Art Center is adjacent to 2Johns Restaurant, 2151 Airline Dr. , Bossier City. 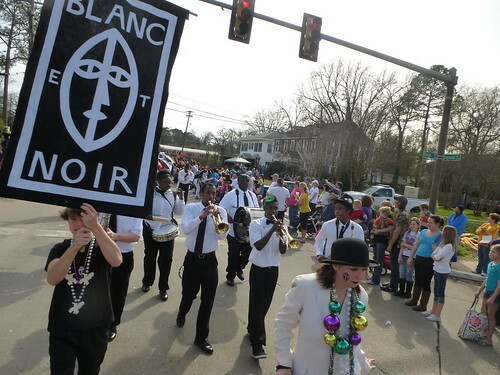 Blanc et Noir Marching Society leads the Krewe of Highland Parade on Sun, March 2, 2 pm; join us! Krewe of Highland Parade, Blanc et Noir Marching Society, a photo by trudeau on Flickr. The New Orleans-style carnival marching club experience is what inspires Blanc et Noir of Shreveport. Music from Dirty Red and the Shreveport Second Line horns combined with the Beat The Street percussion corps is going to make a jazzin' second line experience. And the Blanc et Noir festivities begin with a pre-parade brunch. 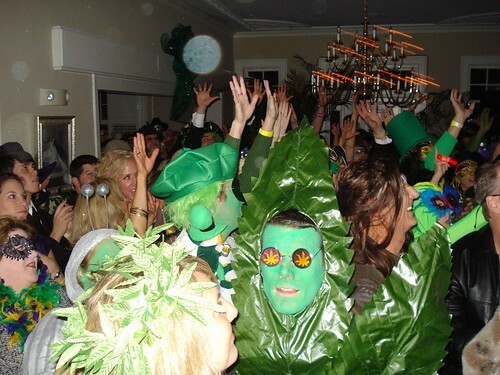 Throw together a costume of any sort. Black 'n white is favored, but anything will do. Please don a mask or face paint. Beads, brunch and stickers, $35 per person. Those who can contribute to the costs of the horns, please don't hesitate to write a check to Blanc et Noir. RSVP to Marion Marks, 318 349 7063, or Robert Trudeau, 318 272 6045. Krewe of Highland Bal Masque, a photo by trudeau on Flickr. Friday, February 28 @ 7 pm, say Queen Highland XIX Victoria Provenza and Captain Kristy Rabalais. Randle T. Moore Center. $40 tickets (or $45 at the door) Heavy hors d'oeuvres, cash bar, dance music by Mars Hill Band. Presentation of court, 8 pm. will be required to purchase a mask for $5 at the door. Tickets are available for purchase now at Marilynn’s Place. Sponsorship opportunities for the Bal Masque are available. The Orchesis Dance Company from Grambling State University and the Louisiana Dance Theatre, Shreveport, plus additional singers and actors - such as Nia Savoy, above - will present “Can I Get a Witness” Feb. 27-28 at the Emmett Hook Center, 550 Common St., Shreveport, says Vincent Williams. The production is dedicated to Hattie Wade, retired choir teacher and the minister of music at Galilee Baptist Church, where she has served over 40 years. The original score of “Can I Get a Witness” is by David Barr with revisions by Williams. 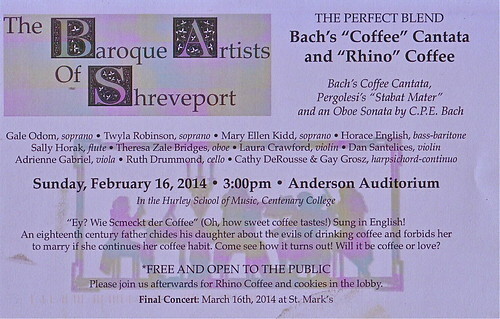 Tickets are $10 and can be purchased at the door or reserved by calling (318) 687-2672. 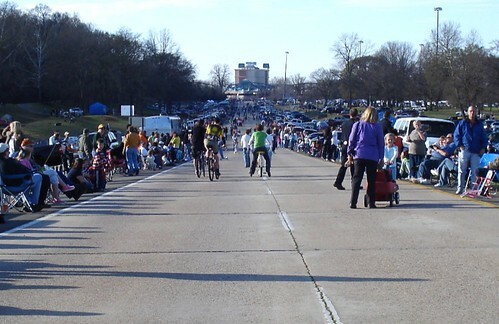 Clyde Fant Parkway / Centaur Parade route, a photo by trudeau on Flickr. Cyclovia is the closing of streets to give right-of-way to bicycles and pedestrians. The idea originated in Bogota, Colombia, says Wikipedia. Locals treasure the principal Carnival parade days, Feb 22 and March 1, as a time for freely biking the major thoroughfares. Ride in costume or not, say local bike enthusiasts. 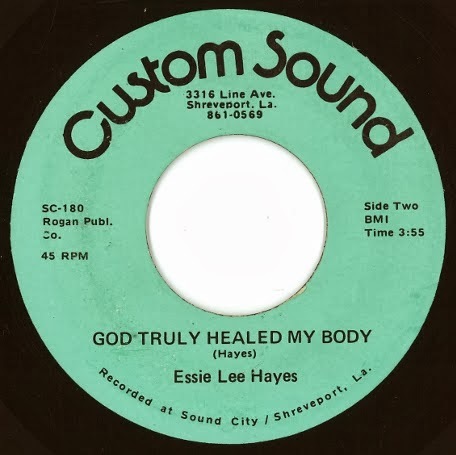 Around 1972, Essie Lee Hayes recorded two gospel songs at Sound City Studios in Shreveport, Louisiana. “God Truly Healed My Body,” relates a story about Sister Essie’s sickness and subsequent healing. This spoken recording features a haunting, repetitive guitar...it's a favorite around these parts. Texas Ave Makers Fair Ap 2014, a photo by trudeau on Flickr. The Texas Ave Makers Fair has undergone a massive site change. "We will NOT be under the permanent structure across from SRAC's Central ArtStation," says Dan Keele. 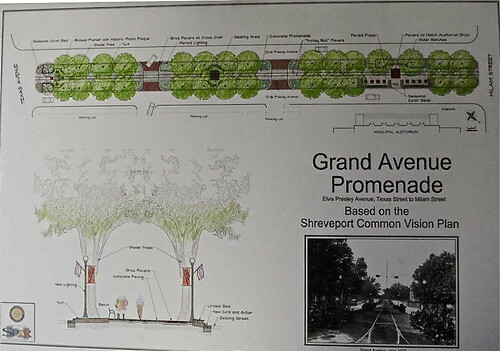 Now integral to Shreveport Regional Arts Council's UnScene, the plan has been expanded to a big city-style street fest site. "In collaboration and support of our partner the Texas Avenue Makers Fair, there will be no UnScene/UnKnown Market or UnScene Juried Arts Market in April," adds Kelly McSwain. THE WOLF OF WALL STREET, a photo by Ma_Co2013 on Flickr. Robinson Film Center, Texas St, Shreveport. CentaurGeminiRoutes2014, a photo by trudeau on Flickr. Clyde Fant Parkway to East King's Highway, basically. Julie Crews, Ruston, La., a photo by trudeau on Flickr. The Bossier Arts Council is open to artist submissions for the 2014-2015 Gallery Season, says Leigh Anne Chambers. BAC will be accepting applications from March 1st- April 30th. In addition to completing the application form (download: www.bossierarts.org) the artist must submit 3-5 digital images of their work, artist statement, artist biography, and resume (self taught or emerging artists do not have to submit a resume). Guilds, groups. or societies need only to submit one packet for their organization. Packets need to include an organizational bio, organizational statement, member list, and 3-5 images that best represent the groups overall aesthetic. 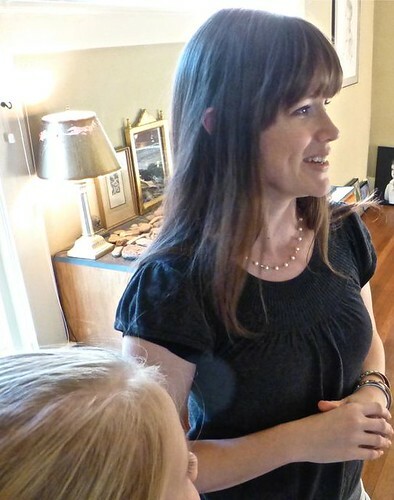 The Bossier Arts Council manages seven spaces in both traditional and non-traditional settings. They accept artists at all levels of career paths. Application are processed and assignments are made by the BAC Gallery Committee which is made up of professional artists and community members. Please contact Leigh Anne Chambers, Executive Director at 318-741-8310 or via email at leigh@bossierarts.org with any questions. Oil composition by Julie Crews above is currently on view at Gallery Fine Arts Center - adjacent to 2Johns Restaurant. Kate Archer Kent, Shreveport, a photo by trudeau on Flickr. "The Spring 2014 membership campaign is underway and your support is needed now. Our theme is "I Love Red River Radio" and we hope you will show your love with a pledge of support," says Kate Archer Kent. "Everyone who pledges is automatically entered into each drawing including our final one for Google Nexus 7 Full HD Tablet at the end of our drive. 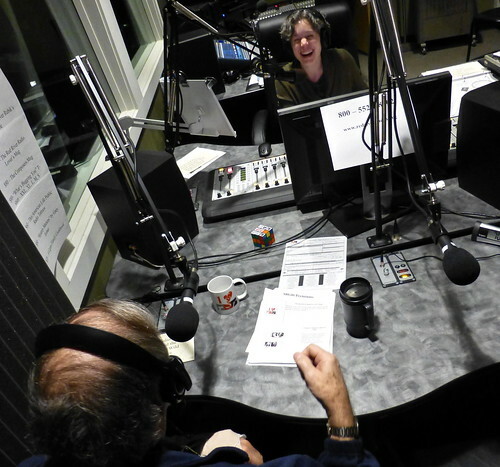 Call in at 800-552-8502 or go online and pledge now." KillMockingbirdSLT, a photo by trudeau on Flickr. Favor: Blayne Weaver, a photo by trudeau on Flickr. "If you like edge-of-your seat, dark, twisty movies, this one is for you. It is not for the faint of heart," says actor Blayne Weaver. Raised in Bossier City but a NYC actor and filmmaker for some years, Weaver returns to Shreveport with his latest works in hand. Weaver impressed local theater audiences in the 2013 River City Rep drama, "Art." 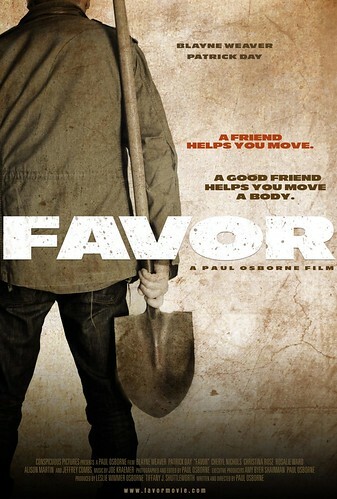 "Favor" will be released on Pay-Per-View, VOD and DVD on April 1. Thurs night Weaver will be doing a Q&A following the film and then having drinks at Abbie Singer's Bistro. SBFunguide.com, a photo by trudeau on Flickr. SBFunguide.com is a self-filling site and self-correcting, too. Rich Table, San Francisco, a photo by trudeau on Flickr. 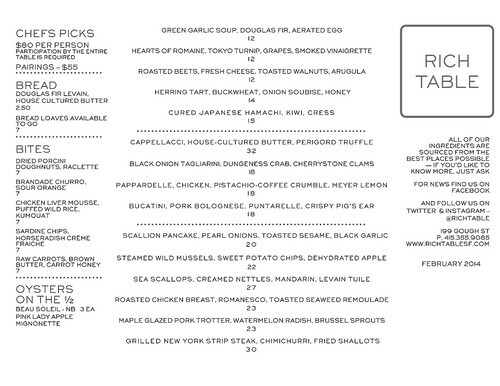 Meet Chef Evan Rich of the San Francisco restaurant Rich Table on Tues at Central Artstation. In preparation of the June UnScene artist residency with Rich Table, we welcome Culinary Artist Evan Rich to Shreveport Common, says Casey Jones. Tuesday, Feb 18, 6 pm to 8 pm to participate in a discussion with Evan Rich about the Farm to Table/ Locally Grown/ fresh food movement. Learn about the Vision for the upcoming 2-week Residency in June, and determine how artists can participate! Julie Glass sculpture, Texas Ave, Shreveport, a photo by trudeau on Flickr. Escutcheons of concrete seem to float in the air on an empty lot aside the 800 block of Texas Ave. Sculptor Julie Glass recently installed the surreal series, which she calls "Uplifting." 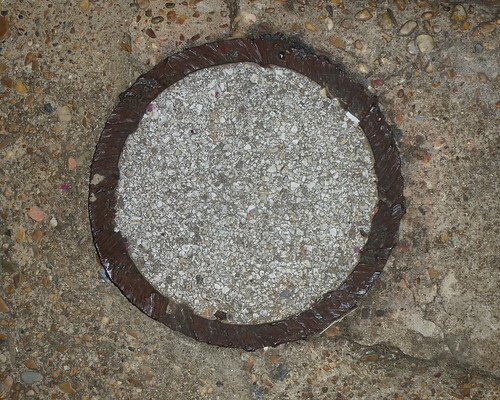 In what will one day be a part of Shreveport Common called Caddo Park, Ms Glass leveraged 3-inch thick plates of concrete from the pavement . As a welder she was able to mount them on top of rebar stalks and weld steel fingers to the mount so as to firmly hold the macadam. "I have been biking in Broadmoor and walking around downtown Shreveport the last several months as a way to balance activity with my sedentary work life (she is an attorney). I began noticing and eventually became obsessed with the beauty and design of the myriad cracks and imperfections in concrete streets and sidewalks. I started working on a series of sculptures and mixed media pieces based on these exciting irregularities," writes Glass. 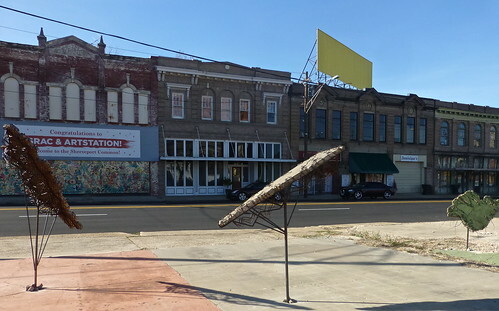 "Thinking about a public art installation, I walked around the empty lots of Shreveport Common in the triangle between Cotton, Crockett and Texas Streets. The concrete slabs have beautiful designs in them. I decided to choose some of the designs found on these concrete slabs and literally lift them up so they can be seen by passers-by. This serves two purposes: a) it adds color and visual interest to a vacant, dilapidated area, and b) it helps people to realize there is beauty and potential in the imperfections of the area. While perusing the vacant lots in Shreveport Common, I also noticed an old rusty metal rope barrier, held in place on concrete-filled metal posts, enclosing part of the space. I wanted to free it from its concrete captivity and help it soar into the air to express the idea of breaking free from its old decrepit state. So I welded the twisted wires to the tops of the stanchions. This series I call 'Breaking free.' "
The work by Glass is high-concept and poetic but visually low-key. It fulfills what Texas Ave resident David Nelson hopes for in the Shreveport Common art: "that installations are done considering context, meaning, scale and audience." Says artist Kathryn Usher, who has installed a series of chrome and red disks on a fence not far from the Glass work, says, "Julie Glass's work is an effective use of materials sourced from the immediate area." 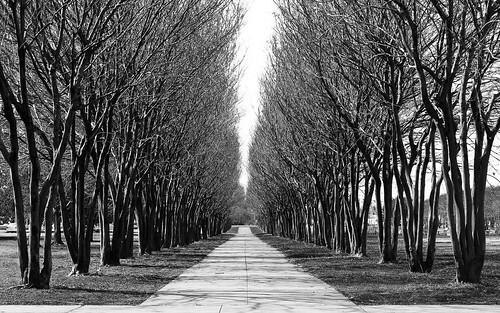 She adds, "The three hefty sentinels lean as thought they were attempting to collect rays of new growth on Texas Ave."
Photos by Talbot Hopkins Trudeau. Ava Haymon at Meadows, a photo by trudeau on Flickr. Jeter Beatles, a photo by trudeau on Flickr. Enoch Doyle Jeter says of his new series of lithographs, "She Loves You Illustrations - 2013: "This exhibition contains fourteen prints taken from original stone lithographs executed between January and December of 2013. 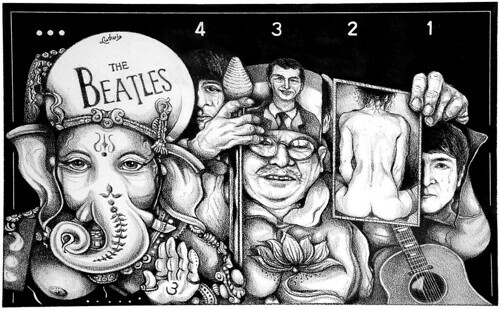 Each image is meant to interpret the songs on the album “With the Beatles,” which was released on November 22, 1963." The illustrations are included in the recent book on John Lennon titled "She Loves You" by Jude Southerland Kessler. "I hope my work captures a tiny bit of the wonder four lads from Liverpool gave to us all," adds Jeter, who is artist in residence at ULM, Monroe, and is proprietor of the long-running music and burger venue called Enoch's. Grand Ave / E Presley Blvd, a photo by trudeau on Flickr. Skateable sculpture by Steve Olson and team. Also music, dance, food and art. baroque, a photo by trudeau on Flickr. 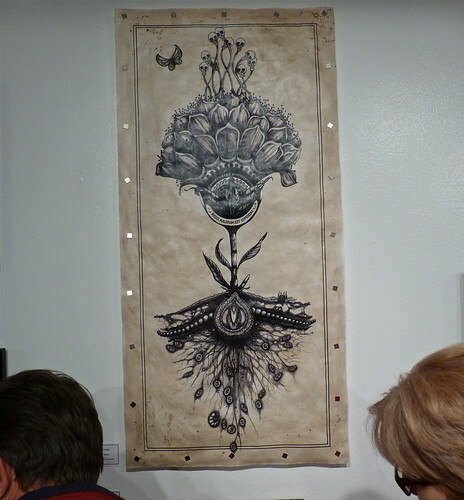 Critical Mass II, Artspace Shreveport: Taffie Garsee, a photo by trudeau on Flickr. The critics return to Artspace Shreveport for talks on Sat, Feb 15, 10 am to noon, on the Importance of critique. They will walk through the exhibit and answer questions about your work - if you are in the exhibition - or general questions you might have about art. This is a crucial experience for any artist, whether you are in the show or not, says Pam Atchison. Photo above: visual arts best of show, Taffie Garsee. 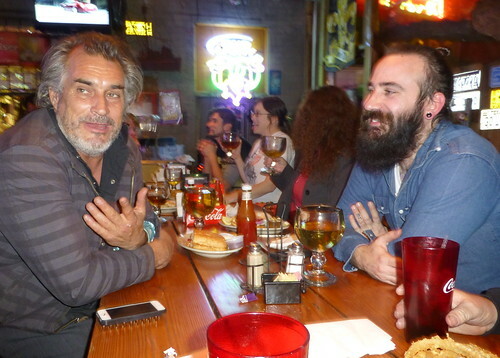 Steve Olson, Josh Porter, Shreveport, a photo by trudeau on Flickr. Steve Olson's “Skateable Sculpture,” adjacent to the Municipal Auditorium, will be vortex center at UnScene on Sat, Feb 15, says Brandon Oldenburg. Noon to midnight: music, film, Juried Arts Market, Flaming Hula Hoops, Poetry Slams, Theatre, and food trucks. The UnScene site is Texas Ave at Elvis Presley Blvd (once Grand Ave). “Skateable Sculpture" is a large, wooden skate ramp designed and crafted by Olson and local artists Taffie Garsee, Jeormie Journell, Ben Moss, and Mary Catherine Rollo. The ramp will remain at Elvis Presley Boulevard and Texas Avenue to be used by the community. 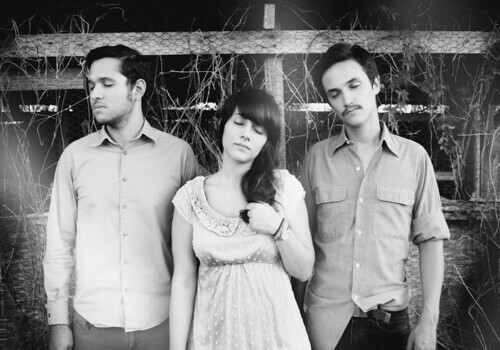 Music: the Ian Quiet Band, Blood Punch, Kings of Pleasure, and Vs.The She Beast. Dance and music: Princess Monro Brown with the Michael Henderson Trio. Lyricists/rappers/poets/hip hop artists Live Beats Cypher and Undeniably Atlanta. 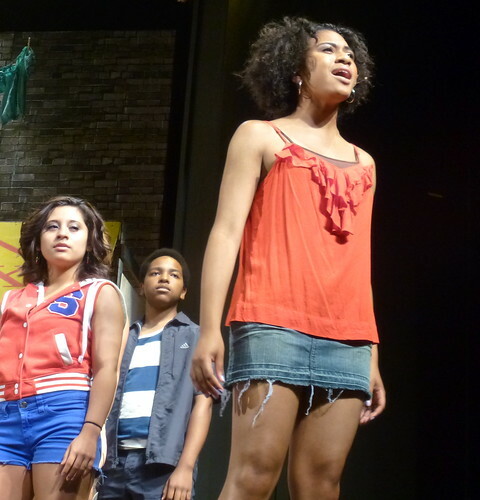 Shreveport Little Theatre Academy performs a Broadway review. Artist Kedrick Williams’ blasts beats via his artistically crafted music player sculpture. Shreveport Hoop Group perform lighted night performances. Additionally downtown: an Artspace Shreveport exhibit based on skateboards and the work of skateboarders turned artists, such as the renowned Brooklyn-based artist Dennis McNett. Olson photo Talbot Hopkins Trudeau. Walk, a photo by jawbone54 on Flickr. How to save the ailing LSU system is a puzzle that has not provoked a lot of answerers. But LSUS science prof Dr. Brian Salvatore (PhD chemistry, U of Penn) has architected a proposal: look to the future in energy resources for a fund that would benefit the LSU system. "Louisiana could start building a renewable energy and energy efficiency endowment now," says Salvatore. A 0.33% "microtax" on Louisiana's refined petroleum products and liquified natural gas exports could build a $2.5 billion endowment over a period of 8-10 years, continues the prof. The principal of this endowment should not be touched for at least 25 years. If invested well, this endowment could provide about $5 billion in interest over a 25-year period. This would allow our universities to use the interest (ca. $200 million per year) to enhance the energy efficiency of our buildings according to LEED certification standards and to install solar energy on our campuses. A 3 MW solar energy installation on the LSUS campus, for example, would generate about $270,000 of electricity per year (at today's electricity rates). That is money that could be re-invested back into higher education on every campus. Such a system would likely cost under $4 million to install five years from now, and it would have a lifetime of at least 40 years. Funds to pay for LEED-certified renovations of our campus buildings and our energy infrastructure as well as a portion of the cost of new LEED-certified buildings could also be provided by this endowment. After 25 years, the endowment principal itself could then be reassigned to some other purpose, if need be (like the nearly insolvent state pension system, for example). Our universities and the Environment would continue to reap the benefits from the installations and renovations even after the endowment were reassigned. Street art, Shreveport, a photo by trudeau on Flickr. The Critical Mass 2 opening reception and awards ceremony is at 5 p.m. Feb. 13 in coolspace (upstairs) at artspace, 710 Texas St., Shreveport, says Casey Jones. Three nationally known critics will name a “Best of Show” winner in each category of literary and visual arts, while selecting finalists to compete — in a live performance — for the “Best of Show” in performing arts. The critics have been selected through a curatorial process lead by San Diego-based critic Robert L. Pincus. Critical Mass 2 is funded by a grant from the National Endowment for the Arts. The opening reception, critique and awards ceremony are open and free to the public of all ages. Expect complimentary treats and a cash bar. The critics for this year’s Critical Mass 2 are David L. Ulin, Anne Marie Welsh and Susan C. Larsen. Each critic will give a public critique and award the “Best of Show” winner from their designated discipline. Welsh and Ulin will present via Skype. Christine Bailey, Norsworthy Gallery, Shreveport, a photo by trudeau on Flickr. 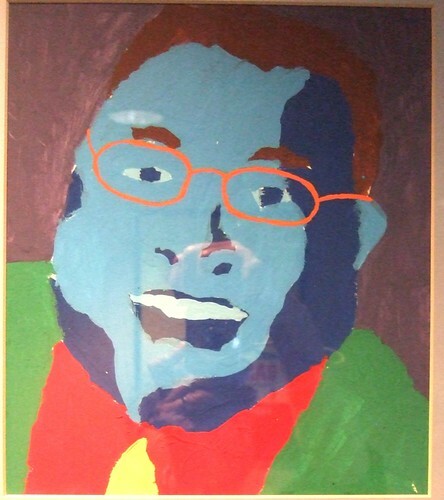 From Bruce Allen to Jerry Wray, a powerful array of regional artists are exhibiting in the Louisiana Artists, Inc, show at Norsworthy Gallery, 214 Texas St, Shreveport. The reception - valet parking makes it an easy in and out at 214 Texas St - is Sun, Feb 9, 2 to 4 pm. 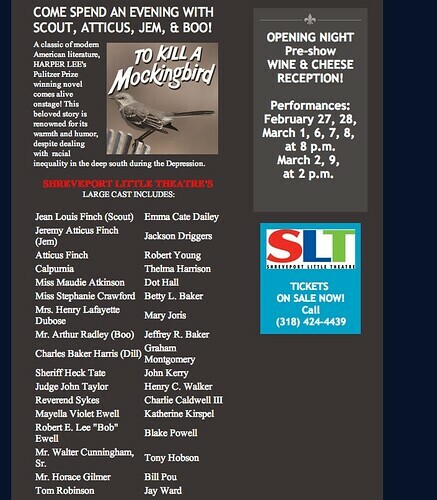 The show continues to Feb 27. 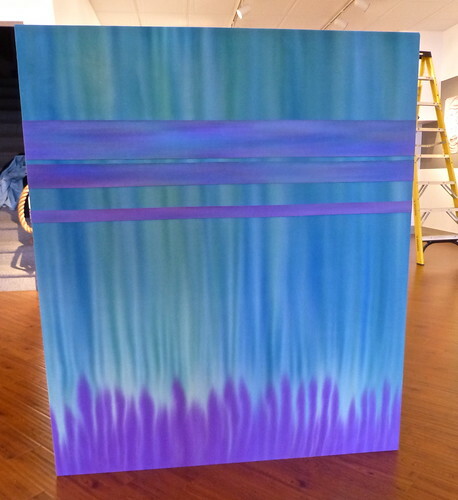 Above, a recent work by Christine Bailey. For the fifth year, the Community Foundation is bringing key sessions from the Aspen Ideas Festival in Colorado to Shreveport-Bossier City. The Aspen Ideas Mini-Fest, sponsored by the Robinson Film Center, The Times and the Community Foundation, will be held Feb. 6, 13 and 20 at the Robinson Film Center. Each July, the Aspen Institute in Colorado holds its Ideas Festival, a conference that unites international leaders to discuss critical global issues. Topics will include the Rev. Martin Luther King Jr.’s “I Have a Dream” speech, higher education and health care. Feb.13: “Will Massively Open Courses Transform the Way We Learn?” with panelists Jim Henderson, David Rowe, Paul Sisson and Darlene Williams. Feb. 20: “Can We Afford Our Health?” with panelists William Lunn, Janet Mente. Admission is free. Sessions will be held at the Robinson Film Center, 617 Texas St., Shreveport starting at 5pm. Rich-Table-San-Francisco_0051, a photo by foodnut.com on Flickr. Culinary Artists Evan and Sarah Rich will oversee the June Residency for UnScene, says Brandon Oldenburg. 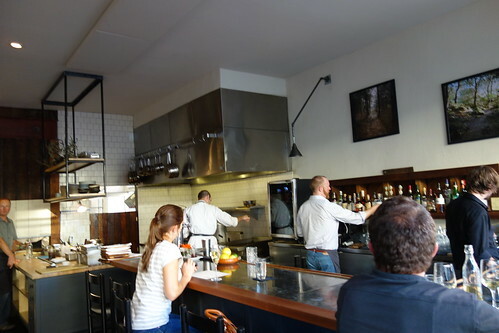 They are at the forefront of the farm to table movement and are owners of the restaurant Rich Table in San Francisco. Sarah Rich is from Shreveport and is excited to return home to share her recipes and relationships while preparing a memorable banquet for UnScene. To "get the party started," the Rich's will be in Shreveport, Tuesday, February 18. Artists are invited to a meeting with Proprietor and Chef Evan Rich to learn about the vision for incorporating the arts into all aspects of this Culinary Arts Residency, including backdrops, centerpieces, costuming, visual presentation of the feast, performances throughout the feast, invitations, and more. The Artists conversation will take place for an hour starting at 5:45 pm, Tuesday, February 18, at the Central Artstation - 801 Crockett Street. 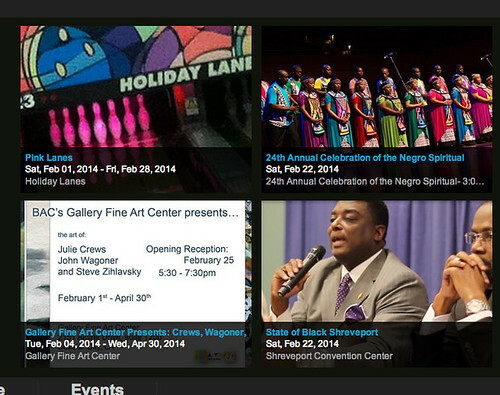 Cedric Glover, Mayor of Shreveport, a photo by trudeau on Flickr. Shreveport-Bossier is America’s fastest shrinking metropolitan economy, according to data from the U.S. Conference of Mayors. The most obvious question to ask, says 710Keel.com, is how did this happen? Who is responsible and how does this get fixed? Shreveport demographer Elliott Stonecipher says the problem comes down to no accountability. Stonecipher said that the local news outlets either don’t have the desire or push to seek out the truth and hold our leaders accountable or the content that they do pull out is critique, labeled and disregarded. Think of news outlets in other metropolitan areas. The most obvious example of what Stonecipher is talking about are newspapers like the New York Times, New York Post and New York Daily News in New York City. Anytime there is a scandal, even just a hint of one, that front cover is the first thing that people see and think of when they go to the ballot box or are asked for their opinion about a particular subject. And the Shreveport demographer added that this is a fairly unique problem. However, it’s not so unique of a problem that other Louisiana communities don’t complain of it either. And Stonecipher noted that the issues with media also tell of a deeper problem Shreveport is facing. “If people here who work hard, do their jobs, care about their city, pay their taxes, when they find out that things like corruption are just accepted now, that the absence of work ethic among public officials is just accepted now, that you can’t talk about those things because you get accused of racism, I think it all adds up to suppression of what we all had thought for decades was a common community interest and goal of good government and growth,” Stonecipher told 710 KEEL. He continued that the way to solve these problems hasn’t be solving the problems. What can be easily noted in Shreveport’s census bureau data maps is the stark differences between the ‘haves’ and the ‘have nots’ in Shreveport and the different issues those residents face separately from each other. And despite having what can be described as an incredibly diverse city, the members of this diverse city are not working together to resolve the city’s problems. What is even more concerning to the Shreveport demographer is the next election cycle. Texas has become an economic powerhouse post-recession. However, despite the close proximity Shreveport has to Texas and the extensive history Shreveport has had tied to the Texas economy, Shreveport-Bossier is seeing little to no benefit from the increased activity to our west. Stonecipher says it has something to do with the demographics. Stonecipher explained to 710 KEEL that it is not a matter of race on the surface that is the problem. The problem is trying to work with government’s like Shreveport where there isn’t one united force working together to improve a city or region’s economy. Stonecipher then went on to look at the future goal of American energy independence by 2020. And all boats can’t be raised? Sam Cooke in B&W, a photo by epiclectic on Flickr. "Fifty years ago this week, Sam Cooke strolled into a recording studio, put on a pair of headphones, and laid down the tracks for one of the most important songs of the civil rights era," says NPR.com/music. It continues, "Rolling Stone now calls 'A Change Is Gonna Come' one of the greatest songs of all time, but in 1964 its political message was a risky maneuver." Author of Cooke's biography, Peter Guralnick, wrote "In the fall of 1963, Cooke faced a direct affront: He and his band were turned away from a Holiday Inn in Shreveport, La. "He just went off," Guralnick says. "And when he refused to leave, he became obstreperous to the point where his wife, Barbara, said, 'Sam, we'd better get out of here. They're going to kill you.' 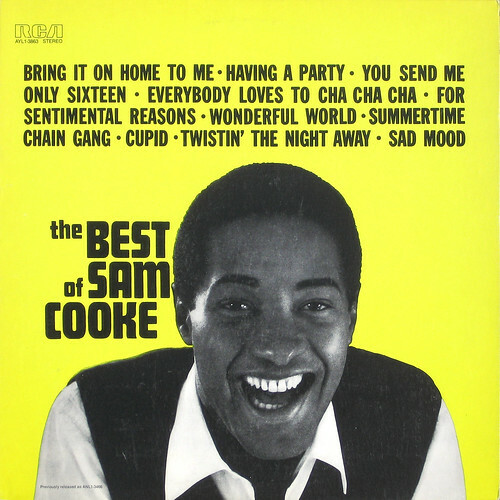 And he says, 'They're not gonna kill me; I'm Sam Cooke.' To which his wife said, 'No, to them you're just another ...' you know." Cooke was arrested and jailed, along with several of his company, for disturbing the peace. Guralnick says "A Change Is Gonna Come" was written within a month or two after that." See and hear more of the story.